Vine struck back against Instagram today, rolling out its biggest update ever to introduce an improved camera, enhanced channels including an "On The Rise" tab, privacy options, and "Re-Vining" (just like retweeting but for Vines). The biggest update for most of us is likely the improved camera, which gets both a visual redesign and a host of new features. When you start filming you'll see a bar at the button with three new options that can be turned on or off with a tap. There's a grid, a target button to tell Vine what to focus on, and a ghost that shows you a superimposed image of the last thing you filmed while you're mid-Vine. Vine also listened to user complaints over privacy issues. Until now, any video you published was released into the service for anyone to see with no way to protect your own account from random strangers. Now you can modify your own privacy settings by going to Profile > Settings > Your Content. 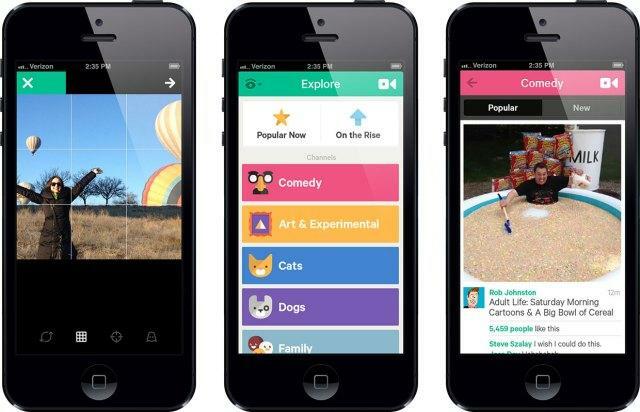 The video-sharing app's Explore tab has also been improved, with 15 channels now available, making it easier to find content or have your own Vines get discovered by others. Each channel has two feeds: new and popular. There's also an On The Rise channel where you can catch Vine videos from accounts that are blowing up. Finally, there's the Re-Vine feature, which I'm already seeing pop up in my own Vine feed. It's only natural that the app would get this feature considering how important the retweet is to its parent company, Twitter, and the button looks exactly the same on both services to boot. If you want to Re-Vine a video just tap the the button, which shows a circle made of two arrows. The full update is available now on iOS. The Android app will get new privacy settings today and the rest of the features next week.